'Tis the season ... FlU season, that is. 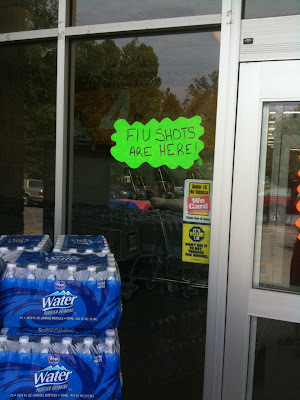 Mrs. HLP found this sign for FlU SHOTS outside the local Kroger supermarket in Kentucky, where apparently the Health Department are running out of the vaccine. It looks like the first symptoms of the FlU are already beginning to affect the local residents — impaired judgement, acute dysgraphia ... the situation does not look good. Some poor employee at the Kroger market is already infected. If you run into him, use the grocery store scene in this Zombieland trailer as your guide to survival. I'm beginning to think that the folks who make letters for reader board signs and marquees absolutely do not manufacture any uppercase L's. Nephi and Katherine Allred spotted this offense at the Leatherby's in Salt Lake City, Utah. The combination of a double lowercase L preceded by an uppercase i makes this PHIllY CHEESE STEAK a particularly juicy treat. Definitely in the top 5 best lowercase L's ever submitted to date. SlC should stick to film festivals. My buddy Berger Boy has proven himself a worthy friend once again. 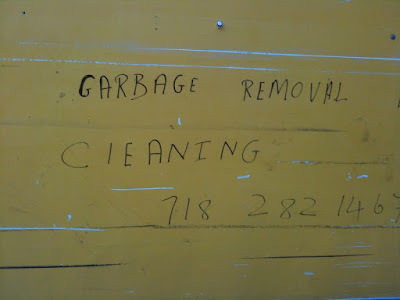 Found on Park Place between Underhill and Washington in Prospect Heights, Brooklyn, Paul submits this GARBAGE REMOVAL ClEANING van. The lowercase-ness of the L is even more emphasized by the uppercase-ness of the i. 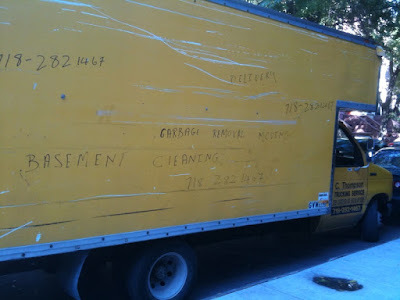 Regardless of the L offense, I wouldn't hire a Man with a Van who was too cheap to at least paint a logo, instead of using a magic marker. This rug FOR SAlE isn't such a rare find, with SAlE being one of the most common lowercase L offenses I've catalogued. But with the fellow selling the rug sitting right next to his merchandise as I snapped the photo, this scenario did present a rare opportunity to delve into the psychology of the lowercase L offender. "Why are you taking a picture of my rug?" he asked. "Oh, it's for a silly art project I'm working on, a photo blog about handwriting" I replied, keeping it vague to avoid having to explain, or worse, embarrassing the rugged rogue. He pressed on, "And what is so special about my handwriting?" I couldn't let the opportunity pass, since he confirmed having written the sign himself. "Well, my blog is about using lowercase L's in words that are otherwise written entirely in uppercase letters. 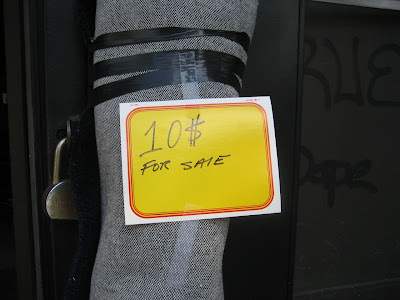 You see here, you spelled SAlE with a lowercase L, which looks misleadingly like an uppercase i." I had to know, "So, were you aware that you wrote your L in this manner?" In an attempt to save face in front of his friends, rug guy explained, with a series of incongruous gestures, "Well, yeah, I guess I did that on purpose, you know, because of the uppercase S, and the A, and the E ..."
His explanation didn't make sense. I felt his cognitive dissonance kicking in, as the rug salesman's expression went from cavalier to concerned. "Does that mean there's something wrong with me?" His friends giggled. "Oh, not at all," I reassure him, somewhat unconvincingly, "It's a more common habit than you might imagine". I walked away without buying the rug. I never intended to, anyway. Travis J. swears he didn't try any FlAVORS of the mini booze bottles located behind the counter at Mars' Cheese Castle in Kenosha, WI, presumably because of the improperly placed lowercase L. Though he was lenient enough to try the cheese, which, he says, was excellent. 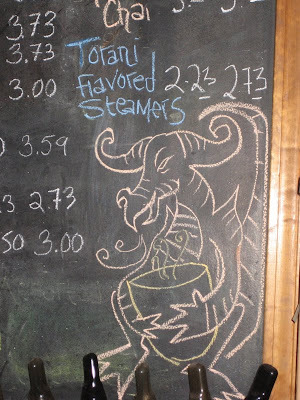 Speaking of flavors, I spotted this flavored steamers dragon at a coffee shop in Brattleborough, VT a few months ago. While it isn't a case of lowercase L amidst uppercase letters, the L is still misleadingly small, like an i, I think. So I'm breaking the rules and posting it here. 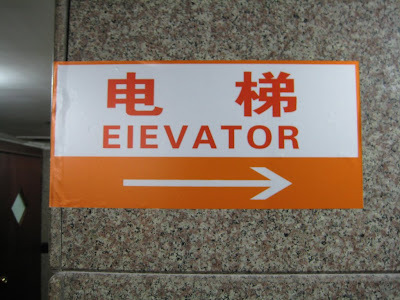 Hillary found this ElEVATOR sign in Beijing. It is easy to dismiss a lowercase L error in the Eastern world as one that was lost in translation. But I blame the mistake on us lazy Westerners, who can't keep a simple 26-letter alphabet simple and consistent. As a result, these Beijing elevator goers get the shaft. 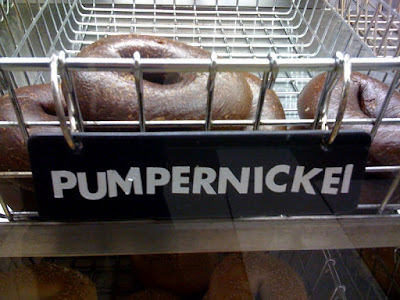 Lara found this lowercase L bagel blunder at Manhattan Bagel in Lawrence Township, NJ. This could be a case of letter crunching, since there would not have been room for PUMPERNICKEl to fit with the uppercase L on the black placard. Still, this sign makes me feel like something is missing. I'll go with the everything bagel instead. While SAlE is one of the more common lowercase L offenses, sometimes it's not the SALE that is the offending word. 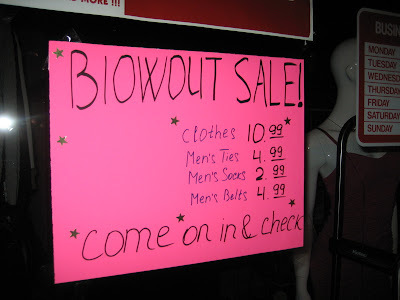 In this case, it's the L in BlOWOUT SALE that is blown out. Discovered on 5th Avenue here in Park Slope, Brooklyn, the store was probably liquidating and going out of business ... and they wonder why.